Pat Carey, 7 Time Winner of Canada's Maple Blues Award Horn Player Of The Year releases his new CD, featuring a classic B3 organ jazz trio with wailing tenor sax. Pat Carey is Canada's SEVEN time Maple Blues Horn Player of the Year Award Winner - 1999, 2000, 2001, 2002, 2004, 2007, and 2008. From The Pas, Manitoba, Saxophonist Pat Carey was formally educated at the University of Manitoba School of Music. During those formative years Pat performed numerous concerts with the Winnipeg Symphony Orchestra sharing the stage with jazz greats Lionel Hampton, Sarah Vaughan, Tony Bennett and Mel Torme. Pat was a member of Jimmy King and The Golden Boy Brass, Ron Paley, Rocky Rolletti, led his own jazz groups and was a busy studio musician for TV and radio. Pat moved to Toronto in 1984 and joined the Downchild Blues Band in 1985, and continues to be a member. Pat has co-produced three downchild CDs, the 3rd, "Come On In", being Juno nominated in 2004. Pat's horn arrangements are an integral part of many Canadian recordings by such artists as Jack DeKeyzer, Chuck Jackson and the All-Stars, Big Daddy G and Sunny Fournier. In addition to his many recordings with Downchild, Pat has recorded with Rita Chiarelli (1995 & 2005 Juno nominated CDs), Sam Myers ( 2005 WC Handy award nominated CD), Kenny "Blues Boss" Wayne ( 2006 Juno award winning CD) and legendary rhythm and blues vocalist and tenor saxophonist Jimmy Cavallo (WC Handy nominee & double Sammy Award Winner 2007). Pat's own band Pat Carey's Jazz Navigators recorded its first CD "Starlight" in 2002, followed by "South By Southeast" released in Feb. 2007. Pat's busy schedule has him performing regularly with his own Jazz Navigators, the Downchild Blues Band, Sophia Perlman & The Vipers, Bradley & The Bouncers, Big Rude Jake, The Nomads and Chuck Jackson & The All Stars. 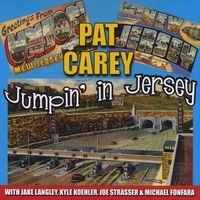 Pat's latest CD, Jumpin' In Jersey, released Spring 2008, was inspired by great B-3 organ groups, "Brother" Jack McDuff, Jimmy Smith, and Jimmy McGriff. Recorded in NY, it features Jake Langley - guitar (Joey DeFrancesco Trio), Kyle Koehler, B-3, (James Hunter Band) and 2007 Maple Blues Award Keyboard Player of the Year, Michael Fonfara.